For our final Avant Jazz Friday in January, Trinosophes presents a special dinner and concert by pianist Kenneth Green. Green performs on acoustic piano, rhodes electric piano and synthesizer. He co-leads The Vizitors and has performed with luminaries like Roscoe Mitchell and Leroy Jenkins. He will be joined by Association for the Advancement of Creative Musicians percussionist and Vizitors co-leader Dushun Mosley. As a long-time AACM member, Mosley has performed with many leading figures of avant garde jazz, including Don Cherry, Roscoe Mitchell, Muhal Richard Abrams and Anthony Davis. Rounding out the group is guitarist Arnell Carmichael, a new-comer to our series. Jason Lescalleet makes sound art that is focused on musique concrete and electronic music. Whether manipulating tape on recordings or performing live by mixing the resonant frequencies amplified from turntables with contact microphones on them, Lescalleett composes his work with an innate musicality. He has worked with Bhob Rainey, Phil Niblock and Aaron Dilloway. 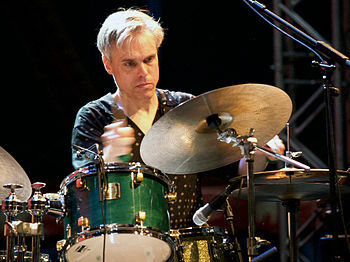 Steve Hauschildt is a founding member of Ohio’s electronics group Emeralds, which won some significant acclaim for its more than 40 releases in 7 years. For this performance he is joined by Cleveland video artist Leigh Silverblatt. Detroit-based percussionist and visual artist Ben Hall rounds out the bill. Doors at 9 pm; $5. Nancy Havlik’s Dance Performance Group and The Subtle Body Transmission Orchestra will premiere (the) nature (of things) likes to hide, a new work based on a score by Music Director/double bassist Daniel Barbiero on February 1, 2014 at 8pm at Josephine Butler Parks Center, 2437 15th St. NW, Washington, DC 20009 (south of Columbia Heights Metro, across from Meridian Hill-Malcolm X Park). Read more about it here. The Shaking Ray Levi Society will present the Gold Sparkle Band, Friday, February 14, 2014, at the Barking Legs Theater, 1307 Dodds Ave., Chattanooga, Tennessee. Keith Rowe, Lee Patterson, and Patrick Farmer will appear Wednesday 12 February 2014, in Bristol UK. Speaking of Tennessee, an experimental music show be take place in Nashville at the East Room on Friday, January 31st. It features Age, Morgan Higby-Flowers, Subtext, and two Chattanooga artists: Secret Guilt and Segamented Worms (sic). Also in Nashville, Metro Parks’ Free Form Friday series returns to Centennial Park on Friday, February 7th with three experimental projects on the rise. At 8 p.m. is Age, the infinite-sample-loop of Josh Gumiela and Luke Rainey. At 9 p.m. is the improvisational duo Regi Wooten and Robert Bond. Chicago’s Ethnic Heritage Ensemble will perform on February 13 at the Thunderbird Cafe (6 pm early show). The show will feature Kahil El-Zabar – percussion & vocals, Ernest Dawkins – saxophones, and Corey Wilkes – trumpet (from Art Ensemble of Chicago). Premiere Performance of Music from New Tzadik Release! Dalius Noujo, Daniel Jodocy (drums) William Shore (vibraphone) Kenny Wollesen (bass drum) Tim Kieper, Sandra Koponen, Lorne Watson, Dixie Estes, Jennifer Harris (percussion) Mike Irwin, Sean Francis Conway (trumpet) Jesse Harris (banjo) Tony Scherr (guitar) Aaron Kean (bass) Jonathon Haffner, Matt Cole, Wolf Dorr, Jessica Lurie, Jason Chandler, Samir Zarif, Sean Sonderegger (saxes) Giuseppe Zevola (poetry) Agota Zdanaviciute, Dorote Zdanaviciute, Zivile Rimsaite (vocals, percussion) Milda Lauzikaite (vocals and trombone) Lina Saveikyte, Kriste Krupovisovaite (vocals) plus many more!